Sharon and her husband have been in their home for more than ten years, and for the past several years they have been stuck in the whirlwind process of trying to obtain a mortgage modification. The downward spiral of the economy caused Sharon and her husband to fall behind on their payments, and after spinning their wheels with different lenders, they feared they would lose their home. Sharon and her husband had been working with the original lender for about a year when they were denied a loan modification. They appealed the decision, but during that process their loan was sold to another lender. They began the process of applying for another modification when their loan was sold yet again. “It changed hands so many times it was making our heads spin.” Sharon said. Sharon described the process of having to work with new lenders to be painful and stressful. She never lost contact with any of her lenders and actually called them on a weekly basis, keeping notes of the dates and times she spoke with them. After researching online and speaking with Jorge, Sharon and her husband decided they could trust in these offers. 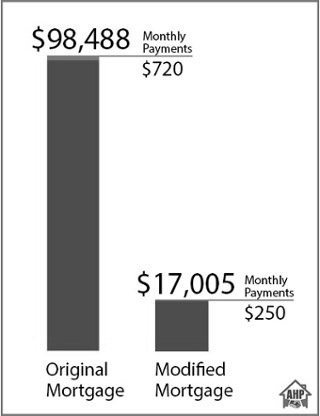 For $2,000 AHP was able to settle all delinquent interests and charges on the loan and cut the payoff amount from $98,488.73 to $17,005 while reducing monthly payments from $720.65 to $250.